METHOD Half-fill a cocktail shaker with ice. Add all ingredients and take out all your frustrations by shaking the hell out of it. Strain into a tumbler and sip while doing something that makes you happy…such as making another cocktail. DEGREE OF DIFFICULTY Obtaining the ingredients is the hardest part of making this drink. Once you’ve got em all, if you can open a bottle and squeeze a lime (not at the same time, unless you’re some kind of demigod/bartender), you can make this drink. Cadenhead Sloe Gin is NOT like other sloe gins. There are lots of different spirits out there to try – gin, tequila, whisk(e)y, cachaça etc – and there are loads of different brands and varieties of each type of spirit to experiment with (see, told you life is peachy). As such, I don’t always use particular brands of spirits when I’m making a cocktail. I might make a mojito with Havana Club rum one week, and Mount Gay Eclipse Silver the next. Either way I’ll have a good drink – they’ll just taste a bit different from each other. When I’m following a cocktail recipe, I figure if it specifies which brands of spirits to use, using them will result in a very close approximation of the original drink. (It won’t be exactly the same, but it’ll be close enough.) Substituting other brands will result in a slightly different drink, but that’s part of the fun. And usually the drink works out just fine. … but this is an exception. Like I said before, Cadenhead Sloe Gin is NOT like other sloe gins. 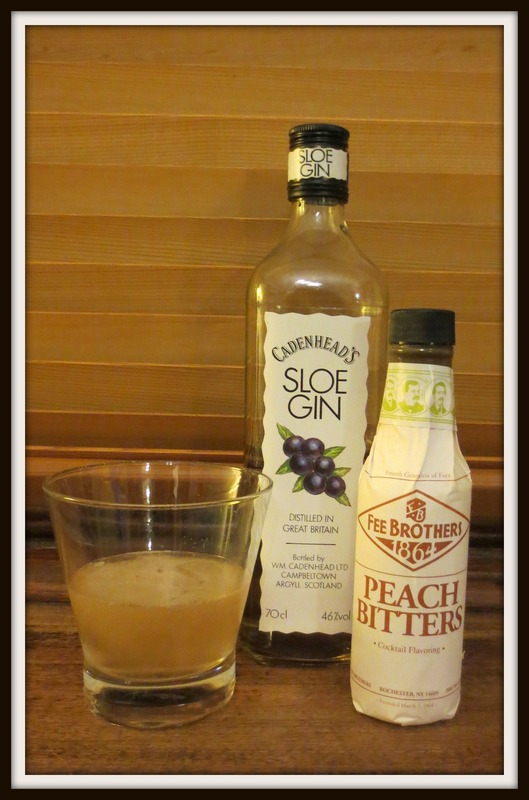 Sloe gins are usually a rich, dark ruby colour with a relatively low alcohol content (about 25%, making sloe gin more like a liqueur than a true gin). They are sweet, aromatic and delicious. Cadenhead Sloe Gin is a full-strength gin (46%) that’s matured in oak and has a subtle sloe berry flavour. So although it’s also aromatic and delicious, it’s more of a dry, full-flavoured gin than a liqueur-style sloe gin – I’d go as far as to say it’s in a different category altogether. Which means – sorry – you cannot use another brand of sloe gin in this recipe and expect to get anything near the same result. Unless, of course, you can find another brand of full-strength gin flavoured with sloe berries. You can sometimes buy Cadenhead online (if you’re in Australia try Nick’s Wine Merchants, though the last time I checked they were sold out). Peach bitters are available online at Only Bitters or in-store at select Dan Murphy’s (yes, by some kind of miracle Dan’s FINALLY stocks more than just Angostura). I will no doubt rant and rave about bitters at some later date – for now I’ll just say Only Bitters is legendary and you really should check it out. So, what, exactly, will happen if you use ‘regular’ sloe gin instead of Cadenhead? Stay tuned and find out…or try it and see, and let me know what you think in the comments section!